 Perfect pH for the human body is 7.365. Add 12 drops of Essante Organics Supreme pH Drops to neutralize acidity and raise the pH value of all beverages and foods and therefore your body. Is healthy pH balance really important? You decide. An aquarium without proper pH balance will cause the fish to become sickly or die. Soil without proper pH will cause the plants to become sickly or die. The same holds true for all organic matter including your human body. We are 70% water, as the earth is. If our water and blood are acidic, instead of pH balanced (alkaline), we have an environment ripe for disease. 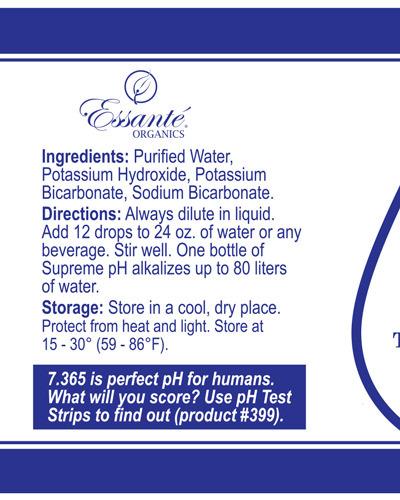 According to the Consumer Health Organization, “Humans need alkaline pH levels to live a healthy life”. 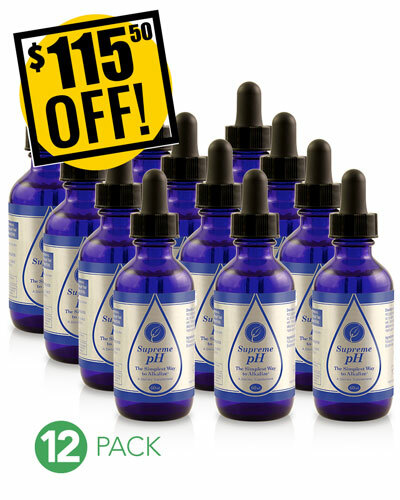 For cells to be healthy they must be floating in a healthy pH or alkaline environment. Can you measure your own and other's pH levels? Yes, simply add a quickly. Add a pH Test Kit to your cart. This kit comes with pH paper (to test saliva and/or first stream urine) and a pH color chart. Each kit provides 100 tests. If I only add 6 drops of Supreme pH to 12 ounces of water, will the water still be alkaline? Use pH Test paper to obtain an accurate pH reading for your body and for the beverages you drink. Simply place the pH paper directly into your beverage to test the beverage's pH level. Place th pH paper in your saliva to obtain your pG level. Can Supreme pH be added to hot soups, coffee, tea, etc. and do they work just as well in hot liquids? Yes, heat does not hinder Supreme pH, this product will neutralize the acidity of any liquid, hot or cold. 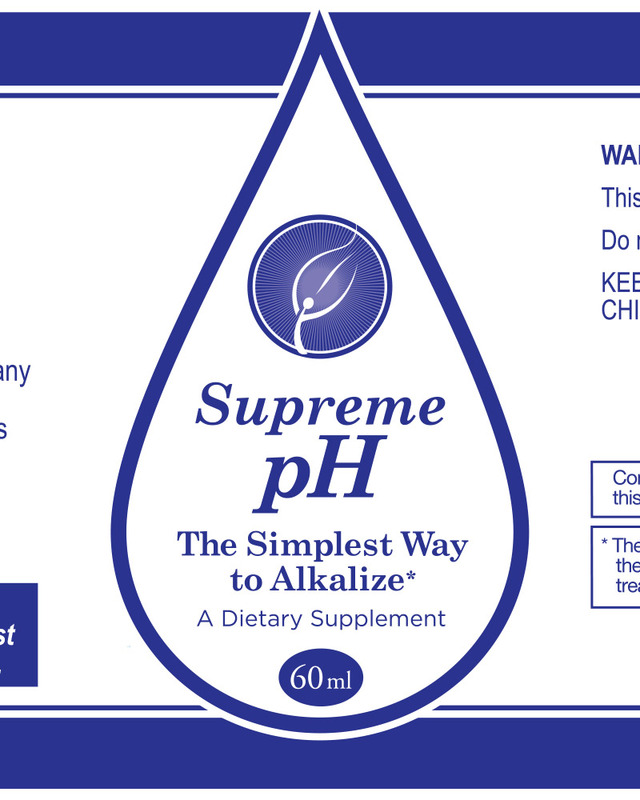 Should I use Supreme pH if I am already alkaline, or only on days when I am acidic? Supreme pH should be used to neutralize the acidity of whatever you're about to consume, if it is acidic. Is it true you shouldn't drink pH balanced water on an empty stomach because our stomach must be acidic to digest food? No, this is a myth. 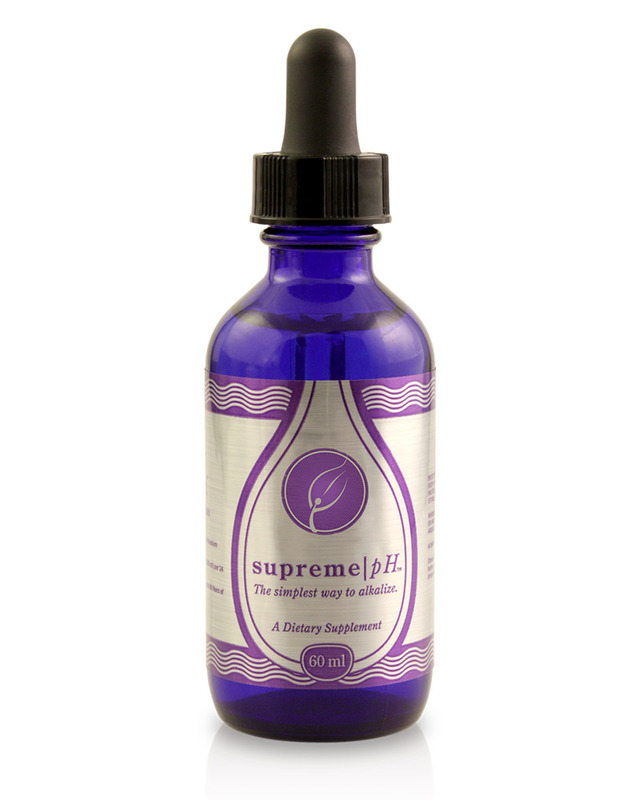 Supreme pH contains Sodium Bicarbonate, which supports digestion. The gall bladder, pancreas and liver also support the digestion process by adding acid into the stomach. To further support digestion and elimination, use Supreme pH coupled with Earth Greens to increase your phytonutrient and electron consumption, thus reducing free radicals and over acidity. Add Omega 3, 6, 9, Vital Oils to further support detoxing: toxins bind to fat, including Omegas, and are carried out of the body. SEE DEEP DIVE BUTTON (Left) FOR PRODUCT DETAILS INCLUDING: Directions, how to use, product flyer, guarantee, ToxicFree® definition, meaning of Leaves Green Footprint®, Essante Foundation mission, ingredient details, efficacy sheets, research, and audio / visual information including video, recording, keynote, powerpoint, etc. 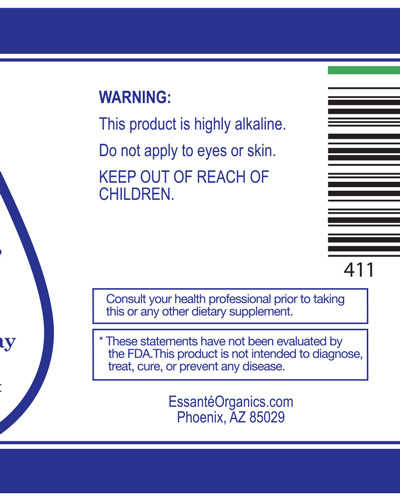 3RD PARTY ORGANIC CERTIFICATION VS. SELF CERTIFICATION: Essante Organics alkalizing and pH balanced nutrition and supplement products are the purest, cleanest, most highly tested and governed health products in the world. Each ingredient in our shakes, powders, capsules, tablets and soft gels are guaranteed to be at full potency and highly absorbable, because they are cold-pressed, whole food supplements that are never heat dehydrated. 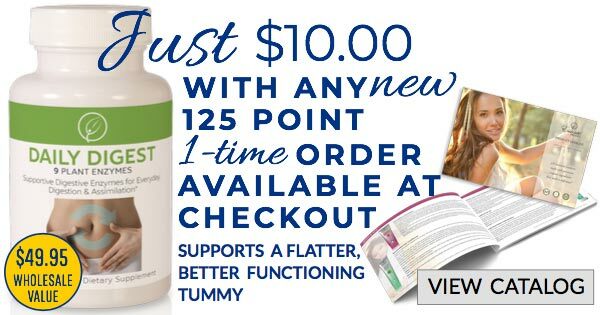 Each nutrition product is guaranteed to be 100% free from all toxins including heavy metals and pesticides. All nutrition products contain Wildcrafted and/or certified USDA Organic® ingredients (see label for all organic ingredients). Each organic ingredient shown on each label is certified organic by the USDA NOP® (United States Department of Agriculture National Organic Program®) or another organic certifying agent approved by the USDA NOP®. The USDA Organic® certifying agency, and those agencies approved by them, are true 3rd-party governing and regulatory agencies that legally monitor and ensure Essante Organics is held to the highest quality and standards possible. Essante Organics, The Organic Living Company, does not condone companies that “self-certify” their own nutrition products in-house, because self-certifying one’s products is a biased method that is not governed or regulated in any way by an outside authority. Disclaimer: Per the FDA Sales Executives, who are not licensed medical providers, cannot use the following medical diagnoses or medical terms when marketing Essante Organics Supreme pH Alkaline Drops: Anti-fungal, Anti-inflammatory, Cancer, Candida, Diabetes, Fibromyalgia, Heart disease, High blood pressure, Hypertension, Low blood pressure, Lupus, Lyme disease, MS, Multiple Sclerosis, Restless Leg Syndrome, Rheumatoid arthritis, Weight loss, etc. The bullet point terms listed above are FDA compliant terms anyone outside the medical profession may use to market Essante Organics Supreme pH Alkaline Drops. Products do not diagnose, treat, cure or prevent disease.